There's no doubt Acoustic Signature's Invictus turntable (�126,500) is among top-tier offerings for those who love analog playback. High-end engineering meets advanced technologies and a "unique magic of opulence, sophistication, dynamism and quality" according to the company. 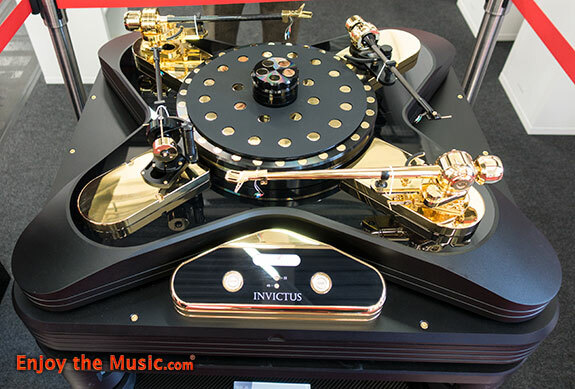 Their Invictus vinyl LP turntable took no less than three years to develop and is the result of intensive R&D at Acoustic Signature. This unit is made from 479 components, with each one being assembled individually by hand. 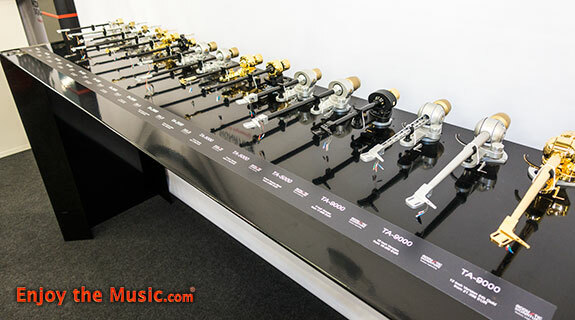 Upwards of four tone arms can be provided for, thus enabling great flexibility in choosing the exact tone arm and cartridge to play back your beloved music. The three-layer aluminum and brass sandwich platter is entirely new and uses CLD technology. A highly damped platter with high rotational energy ensures quiet playback as 54 Silencers with their vibration absorption add that last iota of perfection. And for those curious, the entire unit weighs in at 315 lbs.! Below are a sampling of the variety of tine arms to choose from. Wow! Read our review of the Acoustic Signature Thunder three-motor turntable and TA-1000 tone arm at this link. Longtime audiophiles know and love, or at least appreciate, Quad. Looks like they plan to bring back, or rebirth as it were, their panel loudspeakers. 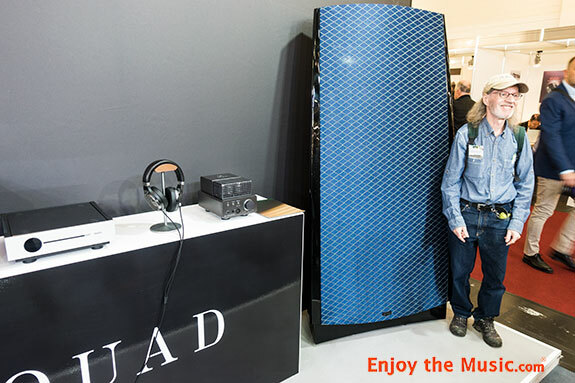 Seen in pic below at HIGH END 2018 was Quad's blue-colored prototype panel speaker (�20,000) that follows in the legacy of their original design. Read our world premiere review of Quad's PA-One headphone amplifier at this link. 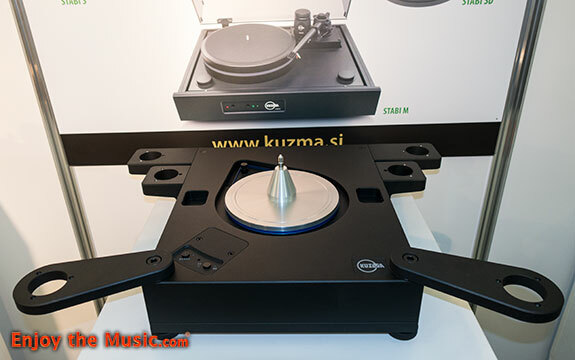 Kuzma's incredible Stabi R (�7100) includes a tone arm, or you can have two if you prefer. Perhaps you only want the base unit and build up from there? 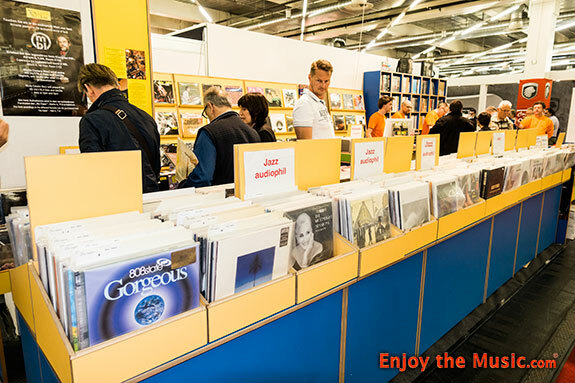 If so, then this turntable is for you! With the base unit (�6300) you can have a custom made plinth to match your decor. Great things grow with Kuzma's Stabi R turntable as it includes their top-line motor, while a very stiff belt drives the platter nearly effortlessly. 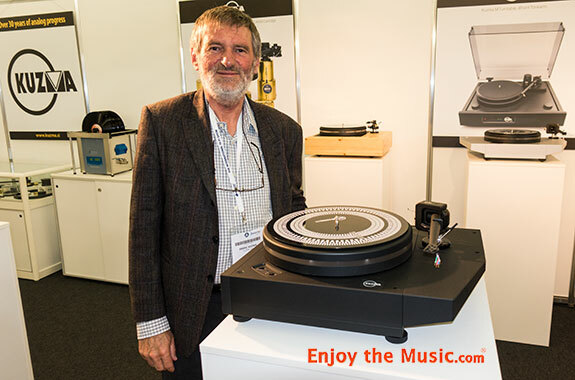 Stabi S is Kuzma's smallest turntable with a design approach normally found only in more expensive models. The motor is housed independently in its own bras tower which dampens vibration of the motor itself. The bearing is highly polished, and made from fine grain carbon steel with a one point contact. Their bearing sleeve is of a combination of resin / textile material, which has excellent damping, non-resonant properties. With a mat on top and rubber damping insert underneath, the sold aluminum platter provides a stable non-resonant platform for records. An acrylic cover protects platter and tonearm while reflecting the turntable's original shape. See our North American premiere reiew of the Kuzma Stogi Reference 313 VTA tone arm at this link. 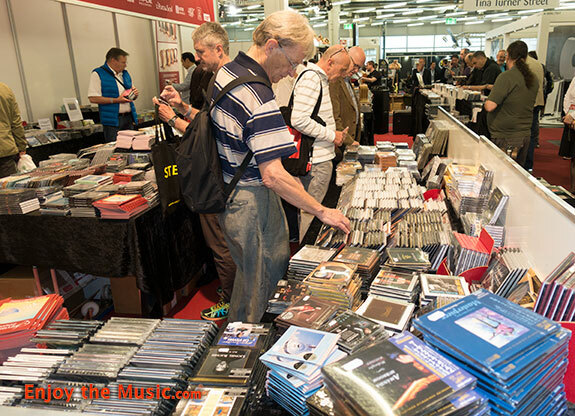 Below are a few photos of the many vinyl, CD, SACD, reel-to-reel, etc dealer tables that were at HIGH END 2018 in Munich. 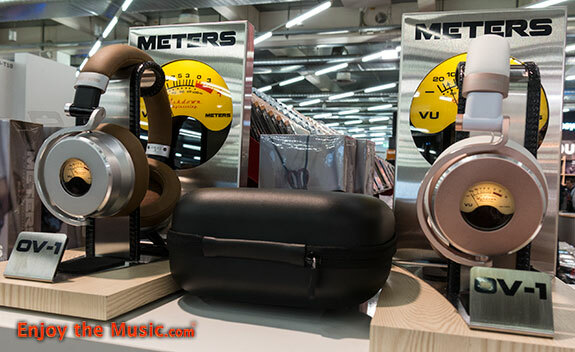 For those of us with meter lust, there's OV-1 headphones by Meters Music (�199 wired, �299 Bluetooth wireless/wired). These glorious headphones feature active noise cancelling, use a lightweight alloy frame for comfort, and are made of protein leather for the headband and ear covers. Of course the meter gives you a reading of the power they are receiving, plus looks soooo cool too! 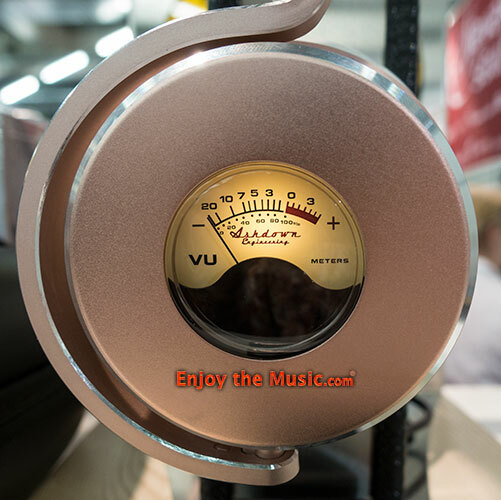 Meters Music by Ashdown Engineering, the same parent company that creates bass and guitar amps for the world's greatest bands such as U2, Foo Fighters, Biffy Clyro, System of a Down, Sir Paul McCartney, Bastille and many more. The VU meter featured on the left and right ears of the headphones are a line-level signal indicator, designed to give the headphones a dynamic look as people around you can 'see' the level of the music you're enjoying. Meters' OV-1 headphones are an over-ear design that features the latest technology with dynamic ANC (Automatic Noise Cancelling) function, making even the loudest environment a place of near solitude with a background noise reduction of up to 82%. While not pictured, for the ladies they offer the OV-1 in white leather and pink/rise gold metal. Perfect! 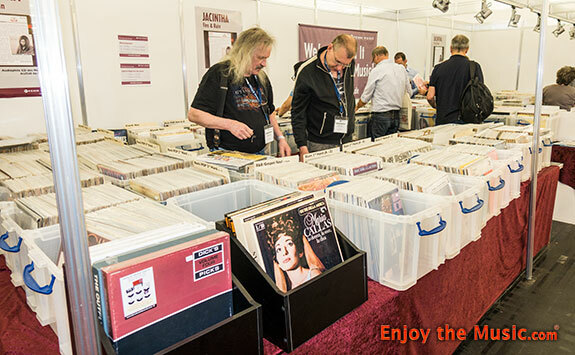 ---> Onward to Part 8 of our HIGH END 2018 show report.